ROCKIN WALLS: What I love about Mortar-My Jack Hammer! 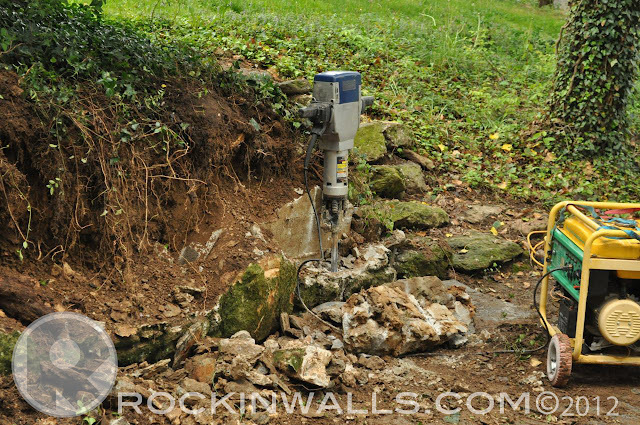 What I love about Mortar-My Jack Hammer! Once stone has mortar it's no longer a stone but a part of a group. I would guess 90% of mortared construction will be disposed of in a land fill. 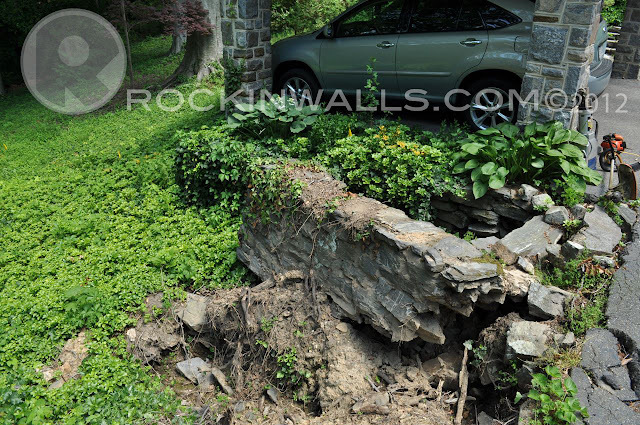 This can not be said about a dry laid stone construction. If a wall fails you just pick up all the pieces and reuse them. You can add to a structure, remove a structure, recycle structure, in the world of green - dry laid stone is at the top of the list for environmentally friendly building practice. 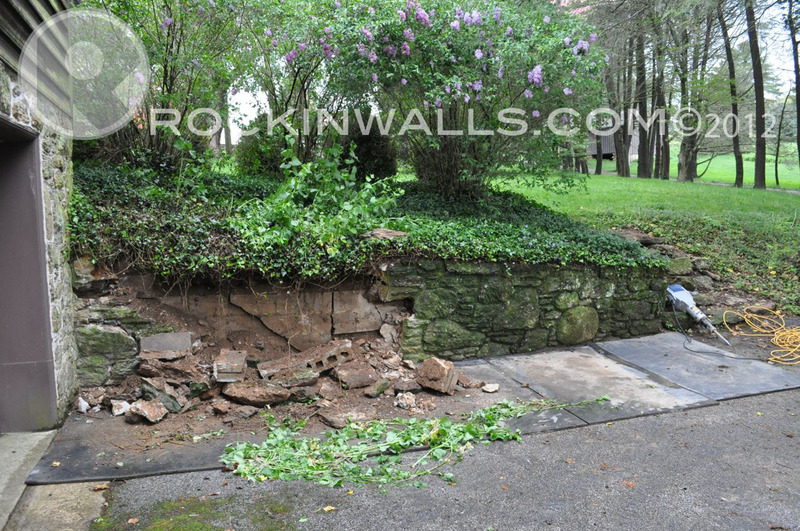 This wall failed because of hydraulic pressure. All but one small pallet of stone could be saved for reuse. The rest was dumped on site. What a waste of good rocks. This wall failed because a large 100 year old Birch tree up rooted in a storm pulling up the steps with it. 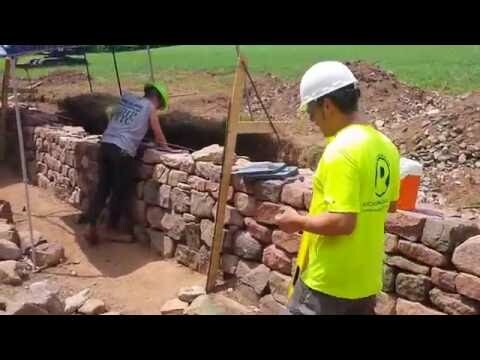 Most of this mortared wall after jack hammering was re-used as packing in he rebuild of the new wall. Just another waste of good stone when failure occurs. You'll notice in this picture above the contractor buckets are sitting on a dry laid stone wall. This was great since I could just take everything apart to use the stone. What you can't see is the yellow flags unless you click on the photo. The Yellow flags are markings for a GAS LINE! Do you think a mortared footer could be placed over top of this? Maybe / Maybe not. All up to the utility company or local laws. At least with the dry laid stone you can remove it as needed if any repairs need to be done. WITH OUT ANY POWER TOOLS. 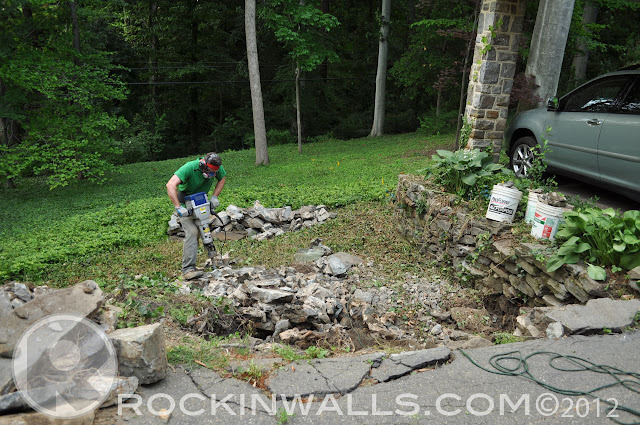 Yup gas line - jack hammer, power tools....etc.... would not be fun with a mortared wall. Just not a pretty picture if something goes wrong!! !